The Card Grotto: Happy Halloween! This is a quick card I have made for my mum. 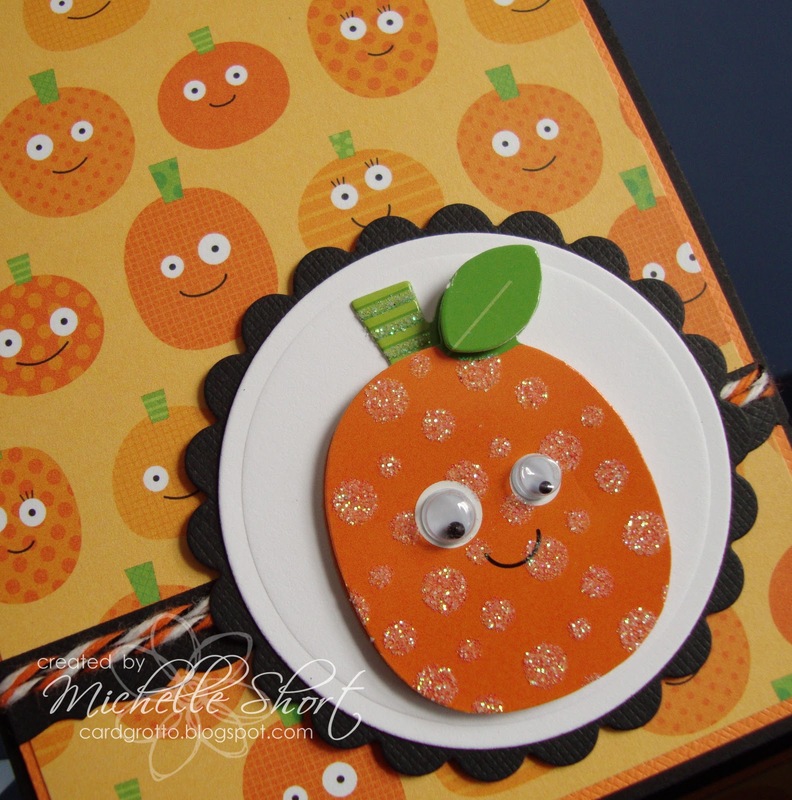 I have first taken some black CS and made into a card base then added a layer of DB Butterfly CS then a sheet of DB Pumpkin Patch paper on top. I have cut a MFT Die-Namics Bracket Border from DB Beetle Black CS, added to the base and wrapped around with DB Halloween Doodle Twine. 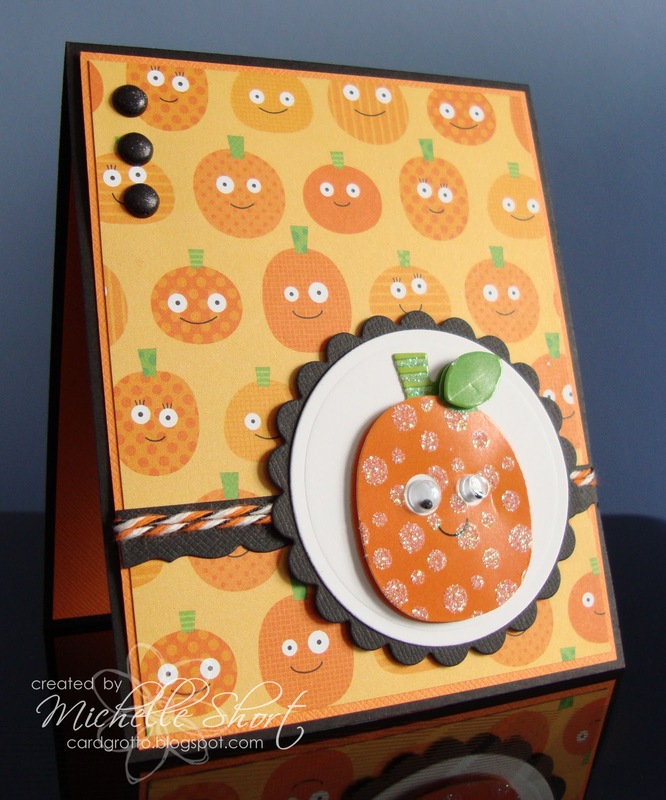 I have then cut out the circles using Nestabilities dies and added a DB Doodle-Pops Pumpkin sticker on; this has been added to the base with 3D adhesive squares. Three DB Sugar Coated brads added to finish. For the inside I have added more DB Butterfly CS and then cut a circle from white and stamped the greeting using the CC Designs Amy R Ghostly Greetings Set in Memento inks. 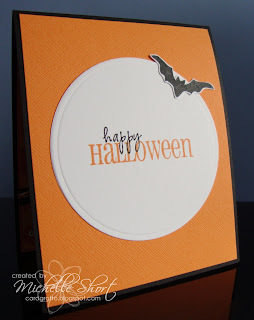 I have then stamped a bat from the CC Designs Gift It Halloween Style set on to white CS and then cut out, adding a little glitter with a Spica clear pen. STAMPS: CC Designs. INK: Memento Tuxedo Black and Tangelo, Copic Spica At You Clear Pen. CS/PAPER: Papertrey Ink, Doodlebug Designs. TOOLS: Nestabilities Dies, My Favourite Things Die-Namics Dies. EMBELLISHMENTS: Doodlebug Designs Doodle Twine, Doodlebug Designs Sugar Coated Brads, Doodlebug Designs Doodle-Pops Sticker. Super cute card hun!! It look fun! Aaw! it is cute! love it!